Ballast Point's Dead Ringer Octoberfest pours deep brown color, the head fades away quickly. The aroma is caramel, apple butter, some spice. The flavor is rich and a little too sweet for me. Molasses, scotch notes, clean finish. It isn’t bad, but it's not my style. Sierra Nevada's Oktoberfest is a collaboration with German Brauhaus Riegele, and it's very good. This beer pours a bright amber, with average head and carbonation. The aroma is malty and rich, with a little lemon zest, hoppy punch. The flavor is buttery and warm and really tasty. Mild banana/fruit notes atop that rich malt, with a hoppy tingle at the end. I just said in the previous review that Octoberfest beers aren't my style, but I liked this a lot. Great Lakes Nosferatu Imperial Red is a fine beer. It pours dark copper/red, the head is creamy and hangs on for a while. The aroma is rich, if slightly muted. A little oak, some brown sugar. The flavor is bigger thant he smell. It's smooth up front, slightly sweet, and then finishes with a wash of hops, caramel, nuts and cereal malt. Nice. Harvest Ale, by Southern Tier, pours amber/brown, average head, average carbonation. The aroma is mild apples and spice, and a little bit of hoppy tingle. The flavor isn’t strong upfront, but the back of the tongue is a smooth flood of warm malt. Orange pekoe tea and caramel round it out. Nothing special, but pretty good. There is a lot going on in South Street's Twisted Gourd pumpkin ale, and I was sure I wouldn’t like it, but I do like it. In fact, I enjoyed this bottle quite a bit. The color is brown/orange, the head is average. The aroma is chai tea, black pepper and pumpkin. The flavor is rich and spicy. There is hot pepper all over the taste, but it works well with the squash/pumpkin notes. Most pumpkin beers are either bland or too sweet. This one is neither of those things. I’d buy it again. Macro-brewery or not, The Boston Beer Company continues to turn out beer that is more drinkable than not. Samuel Adams Rebel Rouser Double IPA is pretty good; and there aren't many DIPA alternatives in this price range that are better, or even as good. This beer pours a hazy orange color with average head. The aroma is slightly sweet citrus with a little bit of a vegetable/pepper thing going on. The flavor starts out bitter and gets more bitter. It's aggressive, a legit DIPA aimed at DIPA fans. The finish is musty and strong. I enjoyed every sip. Stone's 19th Anniversary Double IPA is called Thunderstruck, and it's made with Australian hops and malts. It's outstanding. I haven't enjoyed a Stone Anniversary release this much since the 16th. Thunderstruck pours bright, lemon yellow. Clean and clear, lots of carbonation, medium head. The aroma is pungent hops and something like white grape must. Grapes aren't mentioned on the label, but I detected that grape character in all three bottles of this that I have been able to get so far. The flavor is bright, dry, very strong. The hops are very bitter, the grape quality is still there, along with citrus and honey over a warm, clean malt. This beer is really good. I'd love to see it become a regular release. Ballast Point's Calico is a tasty amber ale. It's not as good as other Ballast Point brews, but not bad. Calico pours bronze color, with medium carbonation and head. The aroma is citrus and honey, and the flavor is more of the same. It never plays any surprising cards, but then again, it never wore out it’s welcome. Commodore Perry is an IPA by Great Lakes Brewing. This is a mild, indistinct IPA. Not bad, not special. It pours bright orange with an average head. The aroma is pine hops and vegetable notes. The flavor has a floral/citrus hop quality, the malt is slightly rich, but the finish is a little watery. Ballast Point's Grunion Pale Ale pours bright, lemon yellow with a fair amount of sticky head. This beer smells great. There is a really rich, bready, malt background and citrus hops. Tangerine, vanilla, butter. 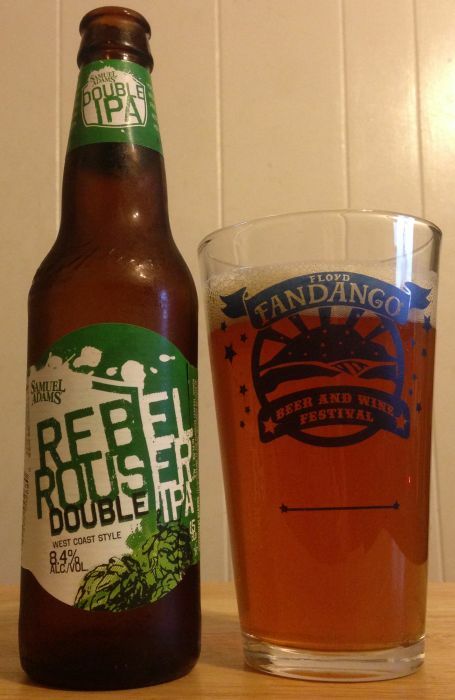 The flavor is distinct from other pale ales, and delicious. There is a strong, almost rye quality mid-tongue. It finishes warm and smooth. One of the best basic pale ales I’ve had in a long time. Troeg's Hop Back Amer Ale pours amber in color with average carbonation and a faint head. The aroma is rich, there are brown sugar notes and some citrus. The flavor adds apples, coriander, and a faint, grassy burn from the hops. Not bad. I don't think of myself as a lager fan, but beers like Great Lakes Dortmunder Gold could change that. This is the best lager I've had since last year's Hoppy Lager by Sierra Nevada. Dortmunder Gold pours orange/yellow with an average head. The aroma is really nice; the malt is bright and buttery, and the hops add some floral tingle. But the flavor especially pops. This beer tastes great. That rich, sweet malt lays a foundation for some surprisingly strong hops. It's just a satisfying beer. I will buy it again.